famous chart of mythical sea monsters. 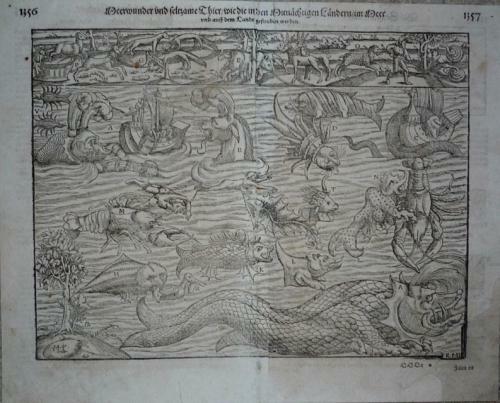 Munster's plate of monsters of both land and sea, taken from Olaus Magnus' "Carta Marina" of 1539, with abundant tusks, horns, and twin-spouts. One vignette shows a galleon trying to outrun one monster by throwing their cargo overboard, while one sailor takes a sight with a musket. Ortelius also adapted many of the monsters for use on his map of Iceland, 1587. One of the most sought after of all 16th century curiosities. In fair condition with some loss at the margins replaced. There are further repairs at centrefold, 2 unrepaired tears in the middle, the bottom right corner has been rebuilt and it has been completely relined on verso with tissue paper.